Hope you all had a lovely Valentine’s day! Another month, another box full of goodies. I was actually pleased with the products this month except for the fact that I received a repeat product. – I like the idea of a double ended product (that way it saves space and is convenient for travelling), but I have way too many mascaras and lip glosses already. The gloss is a pretty pink colour though which would suit all skin tones. – This is a highlight product for the face. The colour is pretty and would be great on cheek and brow bones, but it is a bit too shimmery for my liking. I also noticed that I had to squeeze at least half the tube before reaching any product. The packaging is very misleading! – I have actually received this in a previous Topbox. There has been a few times that I have received repeat products; not sure what kind of system (or lack thereof) that Topbox is using to sort out the products for subscribers. I like this cream, but would rather have received something else that I have not tried before. 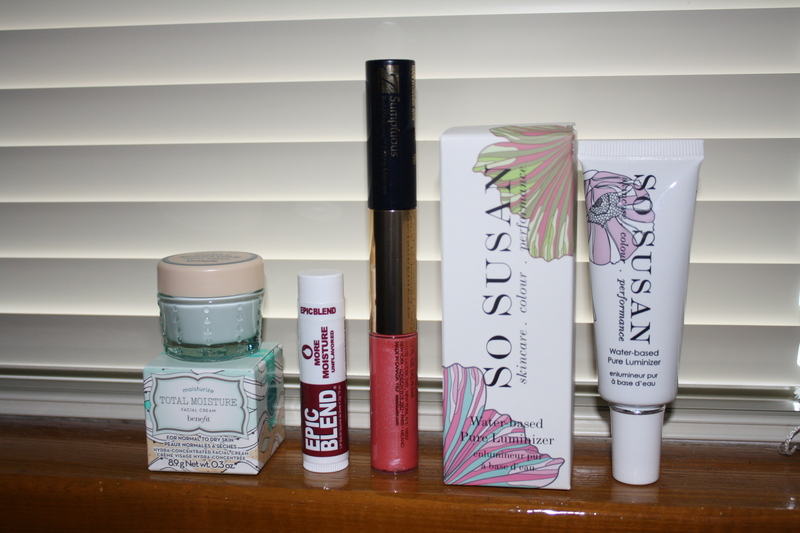 – I have heard about these lip balms and was quite happy to receive one in this month’s box. I am a sucker for lip balms, so this is perfect for me. After trying this out, I like that it is quite moisturizing for my lips. I may just have to make an order to try out the other flavours. This was a good box and I am quite pleased for once after a long time of being disappointed. What I don’t understand is how Topbox bills us in the middle of the month when that is the same time that the current month’s boxes are sent out. How are we to decide if we want to continue or not without seeing the current month’s box? Topbox used to bill me near the end of the month, but somehow that changed for whatever reason. I just don’t think it’s fair to bill so early (I feel like I have said this before…). This is one thing that Topbox could change and also their system of sending out products to ensure that subscribers do not receive any repeats. Just my two cents! This is when I wish I still subscribed to Topbox! You should email about them about the repeat product — I saw someone else blog about it and they got a Deborah Lippmann polish as a replacement! They really need a better system for sorting products!